Make your Valentine’s Day 2019 truly magical! For the day that is dedicated entirely to love, choosing a unique and special gift for your partner is a must. The most romantic day of the year is nearly here – and you haven’t yet found the right present for your special man or woman? We need an idea that will surprise our loved one, that will make them understand how important they are to us and that will communicate our most sincere feelings. We have gathered the most romantic and precious Valentine’s Day gift ideas for you. Romantic chains, rings and earrings to tell your special woman how much you love her. Bracelets and men’s accessories to show your special man how important he is. Choose the jewellery that speaks of you as a couple and celebrate a truly unique Valentine’s Day with your loved one. Romantic, precious, unique: Nomination jewellery pieces will be the perfect gift for your Valentine’s Day 2019! Dedicated to him and to her, the jewellery selected for you includes necklaces, bracelets, rings and earrings made with high-quality materials. 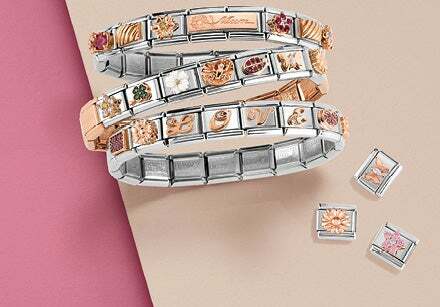 Yellow and rose gold, silver, steel and stone make up the creations of Nomination, whose value is always guaranteed by the Made in Italy brand. Craftsmanship, experience and passion have always characterised the work of this brand, and every piece of jewellery contains within it each of these values. Precious and important: Nomination jewellery is rich in meaning. 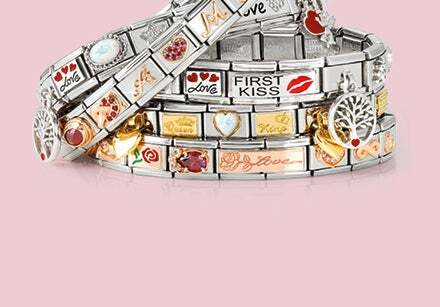 Choose the sweetest, most romantic and most fun piece to give your loved one a truly special Valentine’s Day. Romantic, precious, unique: we have numerous men’s jewellery pieces for him for Valentine’s Day 2019. Bracelets in steel or leather, decorated with stylish details: symbols, letters and charms, made with materials such as gold, silver, stone and enamel. The Nomination men’s accessories are the perfect gift to surprise your special man with a truly unique thought: choose between bracelets that are already made and ready to wear, or create a Composable bracelet that is personalised just for him. A piece of jewellery of great significance, for a Valentine’s Day that will never be forgotten. Surprising our special woman with a magical gift: this is our mission for Valentine’s Day 2019. How can you achieve this? We have selected for you the jewellery pieces that will light up the eyes of your special woman, warming her heart. Bracelets, necklaces, rings and earrings made from precious prime materials of high quality, from gold to silver, from steel to coloured stone. Design and style come together to create jewellery with a unique fascination, to be worn on all of daily life’s occasions, from the most informal, giving a touch of glamour to every outfit, to the most elegant. All you need to do is select the perfect piece for her: from rings embellished with pearls and brilliant stones to necklaces decorated with romantic charms in the shape of a heart. Links dedicated to love are obviously present, to create a Composable bracelet dedicated to her for an unforgettable Valentine’s Day. Discover the gift ideas designed to surprise your loved one!